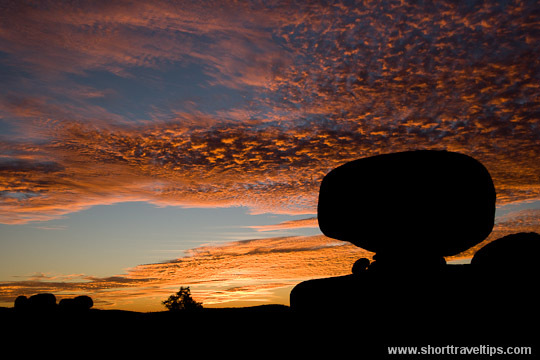 In Northern territory of Australia heading from Darwin to famous Uluru rock you can’t miss another incredible natural formation – Devils Marbles. It is located very close to highway so you won’t able to pass it by without a visit. It is probably most visited place in Northern Territory after Uluru-Kata Tjuta National Park. Devils Marbles Conservation Reserve (also known as Karlu Karlu) is incredible site with its huge granite boulders. It is worth to spend night in reserve and to watch how colours of the bourlders changes during sunset and sunrise with spectacular red/orange sky above. What a beautiful place. Looks like there are even marbles in the sky! Looks great! Unbelievable that they stay like this. An amazing part of the world – pity it’s so far away! It is not so far with all available flights. Love Australia and all her ancient natural wonders! I love it too. It is huge country with so much to see.